The South Okanagan/Penticton Region Health Department has issued a year-round “boil water” advisory. Water must be boiled for a minimum of 5 minutes, filtered, or treated, prior to consumption. 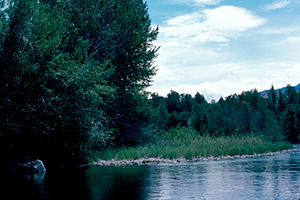 Inkaneep Provincial Park is nestled in tall riverside cottonwoods in a residential area. This park offers wonderful bird watching opportunities. Park users should use caution when hiking around this park; poison ivy is abundant in this area. The park is conveniently located just outside of the town of Oliver. Although this small park offers few recreation opportunities, access to nearby hiking and biking trails, climbing opportunities and golfing make this an affordable and desirable location from which to explore the South Okanagan. Bike the backroads to nearby wineries or ride the International Hike and Bike Trail which runs along the far side of the river. The campground is best suited for tenters and small RVs; most sites will not accommodate large RVs and 5th wheel trailers. This park often has sites available, even during peak periods. 6 km north of Oliver on Hwy 97. The closest communities, towns and cities are Okanagan Falls and Oliver. History: The park was established 16 March, 1956. Conservation: This small park plays a very significant conservation role in protecting the red listed antelope brush, old growth cottonwood and Red three-awn grass. Wildlife: Bird watching is good in the park and the thickets are well known for the black-headed grosbeak, Northern oriole and warbling vireo. The red listed Yellow breasted chat is also found in the park as well as the blue listed Lewis’ woodpecker. Short trails lead from the campground to a short section of the dike on the Okanagan River. It is a scenic walk along the river amidst old growth cottonwood trees with plenty of opportunities for bird watching. For further hiking, visitors must leave the park and drive to the other side of the river where the dike runs all the way to Osoyoos. There is no viewing platform but Inkaneep is a wonderful spot for bird watching with its healthy riparian vegetation. A hand pump is available in the park. This park has 2 pit toilets; no flush toilets. This park offers 7 small vehicle accessible campsites on a first-come, first-served basis. The sites are enclosed by thickets of rose bushes that provide excellent privacy. The sites are not appropriate for 5th wheel trailers and other large RVs. There is a self-registration vault where campers can deposit their camping fee. Oliver is only 6 km from the park.